Goat's butter adds such a uniquely delicious flavour to shortbread that I wouldn't now use anything else. Preheat the oven to 150°C, gas mark 2. Sieve the flours into a bowl and rub in the butter (or pulse in a food processor) until the mixture resembles breadcrumbs. Add the sugar and vanilla. Form the mixture into a soft dough. Push the mixture evenly into 2 20cm non-stick sandwich cake tins, then smooth the surface with a cool, dry spoon. Using a sharp knife, mark out 8 evenly sized segments. Bake for 35–40 minutes, until the shortbread is firm and pale gold in colour. Dust with caster sugar and leave to cool in the tin for 10 minutes. Lift the shortbread on to a wire rack and leave to cool completely. Store in an airtight tin for up to 2 days. Since we're ringing the changes, why not try a cup of russet rooibos tea? 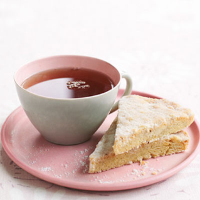 Its delicate savannah tang is as soothing as the shortbread itself.